Since the beginning of the year, the Salfit municipality in the occupied West Bank (Palestine) has become a target not only for illegal settlement expansion and growth but also for the imposition of serious restrictions to the daily lives of Palestinians. For a long time the Salfit area has been subjected to land theft, the uprooting of olive trees and the pollution of the area’s water supplies, as a result of Israeli-led excavations and the dumping of untreated wastewater coming from illegal settlements. These actions produce severe damage to Palestinian crops and to water sources essential for the livestock, and restrict Palestinians’ access to their lands and means of livelihood, by constraining agricultural activity or transforming agricultural land into natural reserves. Since 2017 started, the Salfit area has received 30 orders to stop construction work and 3 notifications for land evacuation. 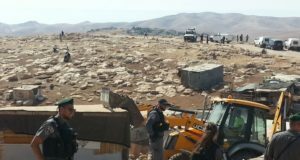 On March 23, in Wadi Qana, a village west of Deir Istiya and surrounded by illegal settlements, Palestinian farmers were prohibited to access their lands by the Israeli forces, who justified it with the need to create a “comfortable atmosphere” for the settlers. Two weeks later, on the same area, with no prior notice, 135 olive trees were uprooted, after being described as “damaging to the view and values” of the nature reserve. In total, 165 trees have been uprooted in the Salfit area since the beginning of the year. Furthermore, in two cases (both in Salfit municipality and Bruqin), municipality crews’ work that would allow Palestinians access to their agricultural lands was stopped by Israeli forces, and 100 dunums of Palestinian land were confiscated in order to expand an industrial zone around illegal Israeli settlements or to build new roads connecting these illegal settlements to Jerusalem and Israel. 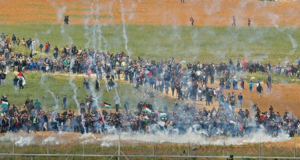 As the lives of the Palestinians living in this area continue to be deeply affected by the intensifying attacks against their mobility and access to their lands, they still challenge them by organizing popular demonstrations, solidarity vigils and working with human rights organisations. To support the right of the Palestinian people to nonviolently resist occupation, as a right enshrined in international law. If you wish to join the International Solidarity Movement please contact your nearest support group for a briefing (see our website, bottom-right corner). If you are currently in the UK, please note that a training session will be held in Manchester on the 22nd and 23rd of April. Call to action: Olive Harvest 2018 – Join ISM now!